Val has lost an incredible 4 stone 7lbs. and is confident she now has the knowledge and tools to keep the weight off for good. A serious health scare made Val decide to lose weight after years of yo-yo dieting. 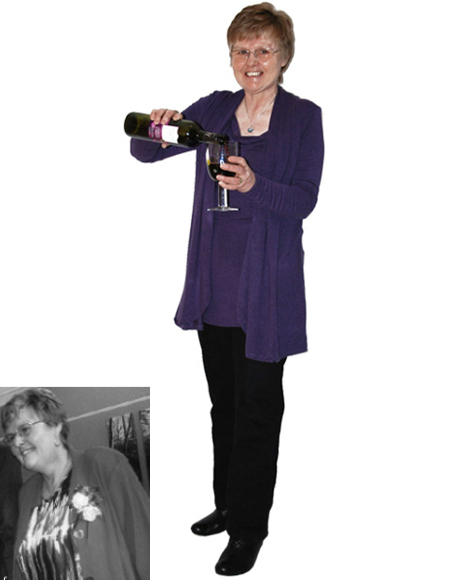 One year after joining Nutracheck, Val has lost an incredible 4st 7lbs63lbs28.5kg. Her blood pressure is now perfect and other health checks are all good. I had a stroke in June 2006 but made a very good recovery. However when I had my check up in November 2010, I was told my blood pressure was too high again and was in danger of another stroke. The light bulb was 'flickering' from November '10 but it did not shine bright until February '11 when I caught sight of myself in a full length window leaving the garden centre. I had recently met a friend who said she'd lost 6lbs6lbs2.7kg since Christmas by calorie counting. So I Googled and found Nutracheck. When I left hospital with my new born daughter 37 years ago I weighed 12st 2lbs170lbs77kg and decided I had to lose weight. I did lose - by hardly eating anything - and got down to 9st 2lb but then regained it all again. Since then, I've lost and regained 3 stone more times than I care to remember. How did you feel at your heaviest? ...frightened! There was the threat of an imminent stroke, but the anxiety made me eat more. At my heaviest I weighed 14st 12lbs208lbs94.3kg as every time I lost weight I always gained more. What habits / behaviours do you feel contributed to your weight gain? Comfort eating! I have eaten my way through a bad marriage, a divorce, a stressful job, car break downs, my children as teenagers, then at college, my daughter leaving home and both grandchildren being born premature...the list goes on. If something cropped up to worry about then I seemed to reach for the bread and the toaster! What were your previous diet experiences like and how is Nutracheck different? Gosh where do I start. Some I prefer to block out such as soups and always eating grapefruit before every meal! Slimfast, yes it works but all you think about all day is food and their chocolate bars give you such a sugar rush. Atkins makes you smell awful. Weight Watchers, lost 3 stone twice with them, then half way through they changed things and said 'what you were doing last week forget, this is now the new improved way that works better' - what's all that about? And the old favourite Slimming World. I've given up counting how many times I lost and gained 3 stone plus. Yes it works but all you think about all day is food. I could never get my head into bread being a sin if you had already had your quota. Plus the idea of 'free food' is damn right scary when you think about it. You have been with Nutracheck for a year now - how do you stay motivated? At the start, the reason was to prevent another stroke as I was genuinely frightened. As for continued motivation - you are going to find this a strange answer - I don't ever feel not motivated. I never really thought about this as a diet with the need to 'be good' and refuse things. I was relieved to find something that was easy and takes no thinking about - I suppose that has just kept me happily plodding along. When I look at my wedding photos, it saddens me to see me so big - I don't intend to go back there. Have you hit a plateau at any point and how did you deal with it? Between April and October I only weighed myself 7 times as we spent summer in Scotland. I was nervous about 'the meeting with the scales' and when I posted this on the forums, Jo Gee came back to me asking 'what made me think I could defy the science... ? I was sticking to my allowance, getting green ticks each week and walking loads, so weight must have come off!' This really made sense and stopped me worrying and pulling out the toaster! So my message is.... share your worries and thoughts about the journey on the forums - someone will pop up with a common sense answer. And for those interested - over the 30 weeks of only weighing 7 times I lost 43lb! What have you learned from losing weight with Nutracheck? The day I signed up for my 5 day trial I peered critically into my fridge, my freezer and my cupboards. Nothing in there disgusted me or made me feel ashamed I was eating 'bad foods' . I have always bought sensibly and cook a lot of things from scratch, but I do enjoy oven chips and fish fingers in a sandwich! But I know that won't make me weight gain if the portion is controlled - and that was my problem before, I had no portion control. I have learnt weight loss is not something that needs to consume your life, your thoughts, your social life! If I was out I would never choose to eat something just because it would save a red cross in the diary. I eat what I want to eat and work it in. To me 'bad' is not hitting my 5-a-day every day and having no balance in the diet. At the top of the Nutracheck page it says 'it's about balance' - I always had the balance just not the portion control. I dislike exercise and have no desire to see the inside of a gym. I can't swim or ride a bike (due to loss of coordination and balance since my stroke), so walking has played a big part in my weight loss. I started off by setting my mobile phone alarm to bleep after 5 minutes. I'd walk till I heard the bleep and then turn around and go home. I built the walking up to 30 - 50 minutes at least 4 times a week. I love to say I have lost 4st 7lbs63lbs28.5kg by counting calories and walking (and that is with a setting of 'inactive' in my profile through my entire weight loss journey). How confident do you feel about keeping the weight off in the future? I know I am a person that needs the diary because I love food! So the diary will keep the brakes on for me. I feel confident it will work. I am happy to think of myself as a lifetime NC member! In the same way I check my weekly bank balanceto keep my finances and spending under control, I now have an online diary to keep my calorie spending under control - I just know it will work for me! What advice would you like to give to anyone looking for a weight loss diet? Join Nutracheck and count the calories! Join in the forums they are people just like you who joined for the same reason as you did. Be brave and put up a profile picture. Walk or do something you like - not do things because you think you have to. And eat the foods you like ,not what you think you should eat. This is not a diet, it is a way of eating that fits in with life. I know for certain that to lose weight you do not have to commit to 5/6 hours a week in a gym with expensive membership. Remember you can only happily achieve if it fits in with life, do not make life fit in with losing weight! What are your personal tips for keeping on track with your diet? First of all lose the word 'diet'. I have found a way of eating that fits in with life. Keep the kitchen scales and pen and paper (or your mobile) on the worktop at all times. Read labels, become aware of how you are spending calories and that takes care of the portion control. Two things to definitely join in with are the Green Tick Challenge Your 'Week View' as that keeps the brakes on and is a gentle reminder that all days do not need to be perfect, just aim for the green tick week. And join the Forum Challenges. To be put in a team is motivation! It goes without saying the Pedometer and walking post is a must! Buy a good pedometer - I have the Omron walking style pro. I wear it all day everyday and the only exercise I ever record is steps into the pedometer bit of the exercise diary. That's enough to burn the calories needed to lose weight if you are moving more than you were before. Aim for at least 6000 steps a day, I don't always achieve that but have still lost weight. If you have a bad day, draw a line under it and move on. Nothing bad happens because you ate a pie, just record it and forget it. Know when to stop losing. I was a bit silly and was letting a piece of virtual silver cloud my thinking. I have lost 4.5 stone and have 4 gold awards and 1 silver bling under my NC profile. It took a couple of weeks for it to sink in that maintaining may mean the silver flickers on and off but that doesn't mean I am not maintaining. I found this paragraph when searching the internet and it summed up how I felt when I knew I was changing from the weight loss road to the maintaining road. Stay realistic! Beware of 'how to be even skinnier' media messages that lure you into feeling dissatisfied. You have a life to live and enjoy, so hang on the satisfaction of being at a comfortable, healthy weight you can sustain". What differences has losing weight made to your life? My doctor has said my blood pressure is perfect and so are my other checkups. He is happy with my weight and assured me that what I have achieved is just fine. I feel better in myself for losing the weight, more confident. I now never think 'what will happen if I have another stroke' as I have done all I can to prevent it. If it happens it is not my fault it is life. My knees no longer hurt. I can put my shoes on without squashing my lungs! I have gone from a size 20/22 top to size 12/14 and size 20 jeans to size 12/14 depending where from so I can now just walk into shops knowing I can find clothes that fit me! I can move around the motor home easier. When I catch sight of my reflection I smile and think that looks better! And finally - and this one may surprise you - I have discovered I like cake! I never used to eat cake pre Nutracheck because it was always a definite NO on diets. So since 1975 it has been no cake. But I can easily count it into my allowance!